I’m sorted. Got a phone call this morning from Listowel to say I can stay with the couple who put me up in 2007. I must have done something right. The universe is looking after me, eh. This is so much better than staying with someone new, and staying out in Abbeyfeale. in the New Kingdom Bar. If you still haven’t sorted out your B&B in Listowel, don’t worry: the universe will look after you – pick up the phone to Norella Moriarty now. I’ve just been talking to an absolutely fantastic woman. Norella Moriarty is “accommodation officer” for the festival. I rang her because I haven’t yet solved my accommodation challenge. I’ve been so focussed on the blog that I’ve neglected to sort out where I’m staying. If only I’d rung Norella a fortnight ago… She has people crossing the street to avoid her – she’s been so active finding beds. Fortunately all is not lost. I’ve found the phone number of great couple that put me up in 2007. Left a message. Fingers and toes crossed. There’s always Abbeyfeale, and a registered B&B @ Park Lodge (068 31312). If all else fails, I’ll try Abbeyfeale and admire the river. Yesterday I drove over from Glanmire. Out the Mallow road, turned left around the sugar factory onto the R576 through Kanturk, Newmarket, Rockchapel, Kilkinlea and Abbeyfeale. By the R555 with rain all the way into Listowel. I found parking in the square, 1 euro per hour (bring coins), and scampered for the warmth of the Listowel Arms Hotel. In terms of Writers’ Week, it would be hard to exaggerate the significance of this hotel. It’s the nerve centre. Yesterday, there were people in the bar at 1130. I had Americano & scone with butter & jam. Kerry prices. Jeremy Gould and his son Thomas arrived for our first meeting. I was excited and a bit nervous, hoping I wouldn’t put him off chucking in his skills to this project. Together we ‘rappored’. Thomas played on dad’s Iphone. 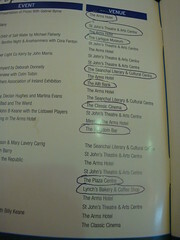 Jeremy may have emigrated to Listowel recently but he has years of visiting behind him and his wife’s people are Kerry. We went visiting the festival office. Moire Logue and Eilish joined us for lunch. We got on great. 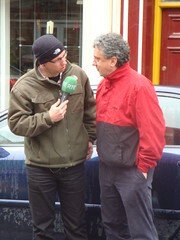 and even saw Billy Keane doing an interviewwalk with a man holding an RTE mic. Monday is 1/2 day in Listowel. 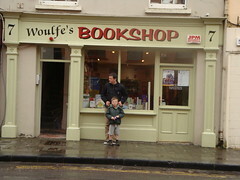 Brenda Woulfe wasn’t in when we called to the bookshop. Left a message to say we’d called. 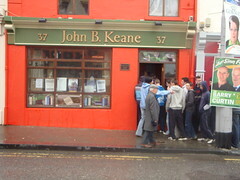 Saw a big crowd of schoolboys being escorted to John B Keane’s pub by their teacher. Imagine that! No teacher ever took me to a pub. Lots of discussion about how to use all the social networking tools to best effect on this blog. I’m no technophile, but not a technophobe either. The thing I took away was the idea of putting a hashtag [#listww09] into Twitter tweets and Facebook updates. Maybe I should put them into blogposts too? It was the search for broadband that made me nervious. I have visions of writing stuff that gets lost because of systemfail. So I interviewed the receptionist in the hotel. She showed me the only public place from which I could connect. When I went testing, my system crashed and I lost my post which I hadn’t saved. That’ll learn me. The walls of the ballroom are 4 feet thick, so no wireless signal there. We’ll need a ‘dongle’. There are two internet cafes in town. Community I.T. 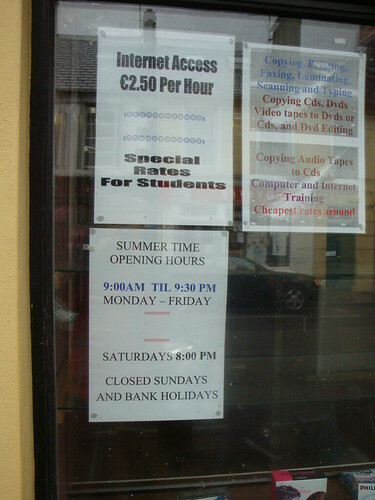 Access, 58 Church Street is open 9-5, Mon-Fri only: 3 euro per hour and he’d be prepared to negotiate a special daily rate. Lovely & warm, clean & tidy, more like an office than a cafe. I have a photo of the other place which I’ll give details of later. It came by email. She kept her promise. It’s a lovely piece of writing. Hopefully we’ll have many more pieces from workshop leaders. I’ll put photos up later.